In this Post: Switching up your displays is an important element in effectively selling retail. Learn 10 tips for how to keep things fresh and sell more! If you have or are considering having retail items for sale in your massage space, switching up your displays from time to time will have a huge impact on how much revenue you are able to generate from the sale of these items. Imagine walking into a store time and time again only to be greeted by the same boring pieces. Do you think you would be inclined to spend large sums of money? My guess is not! People like the impression that they are seeing things for the first time, whether or not they actually are. When they think that they are seeing new things on a regular basis they will be more inclined to make purchases. The notion that they must buy it before someone else snatches it out from under them is a powerful human motivator. Because much of your retail audience is your massage clients, many of whom come in weekly, bi-weekly, or monthly, the importance of switching things up is even more relevant. 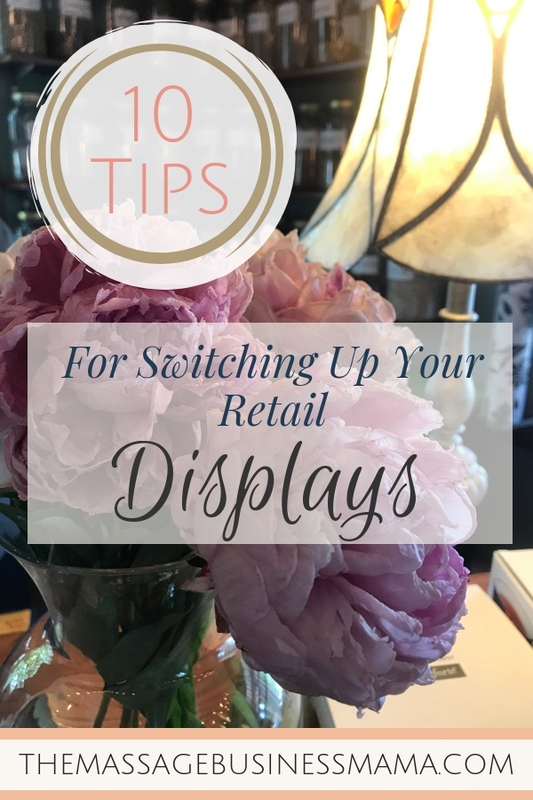 One way to achieve this is by continually purchasing more retail to display, another more cost-effective way (and the way I recommend) is to switch up and redesign your displays on occasion. If you get in the habit of regularly redesigning your space, you will be amazed how things begin to fly off your shelves. Instead of drastically reducing prices just to move items, consider the following techniques to help slower moving items sell more rapidly. Be vigilant about dusting your retail as well as the space around it. Nothing screams “I’m not worth buying” more than a thick layer of dust caked over an item you are trying to sell. One technique I like to utilize is to pull everything “off the floor” and then begin my displays from scratch. This way I don’t get lazy in how I arrange my merchandise. Having a clean slate allows for a more creative approach. As an added bonus, you can really get in there and make things sparkle when shelves are unbridled with clutter. Give height to your displays. Not only does this maximize your display space, it also entices buyers’ eyes to move around the items you are trying to sell. One of my favorite ways to give height is through the use of ladders. The possibilities are endless when displaying with ladders. Show or tell clients about how you have used the retail items in your own life. Explain how they have positively affected your life. Coming from someone they trust, like their massage therapist, your clients will enthusiastically purchase based on your recommendation. When you group like items together this allows the customer’s brain to relax and really take in what you are trying to sell. It also helps things appear tidier and more put together. Use everyday items in unusual ways. 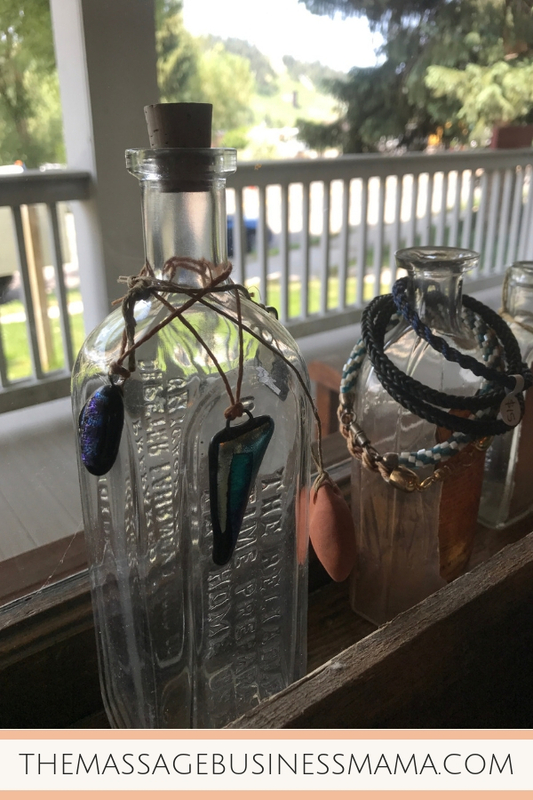 A wine bottle can display bracelets. An old shutter makes an excellent jewelry display. I have a giant metal filing cabinet where I keep all my important files. This cabinet could be a massive eye-sore, but I chose to display cute magnets on it instead. When I first branched into retail I would get super excited about one line of products, and then the next, and then the next. I found my displays became a hodge-podge of mismatched items. When you keep it simple, customers can focus on one or two items and actually contemplant buying, as opposed to being so overwhelmed they cannot even begin to think about making a purchase. If your product has lots of color, utilizing neutral tones behind it will help make it pop. Vice versa, with neutral products, using a bright backdrop will give you the dimension that allows things to stand out. In recent years, I’ve also tried to bring in more products that relate to self-care instead of just items that I like. This more focused method to buying has proven to be a wise decision. The retail is now more timeless, appeals more to my existing massage clients, and requires less buying effort on my part. All win-wins in my mind. This creates a hectic, frantic feel. Display 1 or 2 of each item and store the rest in a closet. Another way to avoid over-displaying is to keep the line of products you sell to a minimum. Be smart about the lines you bring in, and pay attention to what is selling so if you make a poor buying choice you can learn and do better the next time. Pull items for a period of time. Sometimes I will pull things from the shelf for a while, just to give the illusion that items are moving quickly. This is also a useful method for seasonal items, like Christmas soap, or crocheted beanies. Consignment stores are your friend. For things that you just can’t seem to get rid of, consider bringing them to a consignment store, or selling them on eBay. Sometimes it is better to cut your losses on a particular item and move on to something that appeals more to your audience. Retail sales can be like the icing on the cake for your bottom line if you pay attention to what your audience is looking for and keep things interesting. If you fail to do these things, retail can be a significant drain on your bank account. Not only does the merchandise cost money, but so do the displays. 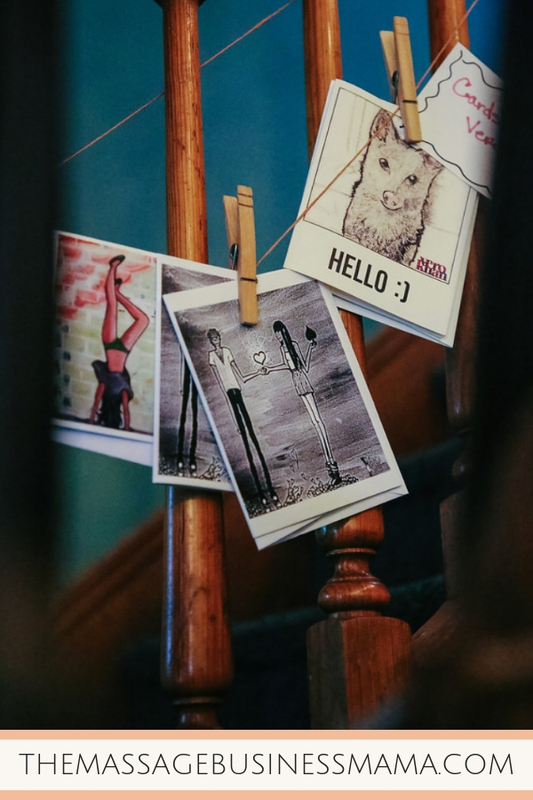 You can avoid the drain of failed merchandising attempts by getting creative and having fun with your displays. Pinterest is an excellent resource to get fresh ideas when you are feeling stagnant. Because a stagnant display means stagnant sales, and my guess is you didn’t expand into retail to keep things status quo. So get out there and rock your displays! And please share any unique or interesting ways you choose to display your merchandise.